HENRY TAYLOR Bass, Ratcliff & Gretton given as Mortgagees. STAR HOTEL Co. Ltd. Given in Kelly's 1934 directory as Star Hotel, Gt. Yarmouth (1930) Ltd. The Cromwell Temperance Hotel (Left) adjoining the original Star. Listed as an inn from 1750. Lord President Bradshaw who presided at the trial of Charles I.
Mrs Vincent (widow) announced 16th March 1786 that she had left her house at the Quay and removed to the STAR TAVERN, at the Corner of New Broad Row, in Gaol Street - Taking the old Billiard Table with her. Nelson visited here in 1800 and a painting of the event was exhibited at the International Exhibition of 1862. Carved oak panelling from the `Nelson Room' was removed in 1813. The panels dating from c1600. eventually re-created in the New York Metropolitan Museum. Advertised for sale July 1823, having been run for the past 21 years by the proprietor who was leaving solely on account of his health. George Bennett, late the Theatre Royal, Norwich, thanked his numerous Friends, 5th June 1824, for the kind support he had received during his short occupation. He announced his determination to merit a continuation of public favour by serving Dinners, Wines and Liquors of the very best quality at Reasonable Charges. With a frontage (with a portico) of 35 feet, depth 200 feet, with six front sitting-rooms, (coffee-room and superb dining room included), 12 bed-rooms, with the capability of adding 6 at a small expence, spacious bar, kitchen adjoining, store-rooms, water closet, and other conveniences, tap-room with bar, parlour, and bed-room attached, capital stabling for 10 horses, granary, hay and straw chamber, carriage, gig and harness houses, stable yard, &c. Including a newly built Brew-house (An advantage enjoyed by no other Inn, in Yarmouth). Bankrupt George Bennett assigned his assets to whitesmith Samuel Sherrington, wine & liquor merchant William Holmes Diver and merchant Samuel Browne on 15th September 1827. For sale by auction Saturday 10th September 1831. A Freehold property in the most perfect state of repair. Advertised August 1835 To Let or For Sale with Possession at Michaelmas. To Let with immediate possession March 1839. With Extensive Stabling, Tap and Brewery. Mr. Bird took over the new ROYAL HOTEL by June 1840. Mary Pestell announced 27th June 1840 that having taken over the STAR HOTEL, she was Impressed with Gratitude, for the Favours conferred on her since she had entered the Old-established House. On Wednesday 15th May 1844 Miss Pestell, the fair hostess, received an order, which arrived at four o'clock by railway telegraph, to provide dinner for 10 or 12 persons at five o'clock precisely, with the fish course being specially requested as mackerel. The Gentlemen arrived at the appointed time and were served their expected meal in Miss Pestell's usual style of neatness and comfort, in the fine old carved room so much admired for its great antiquity. The Gentlemen by train at eight o'clock, quite delighted with their splendid entertainment. Address as Short Quay in 1836, 1850 & 1854. 57 Howard Street in 1896. - Howard Street to Hall Quay). Dental surgeons Suggett and Dunsford professionally attended the Star Hotel on the First Monday of Every Month as advertised January 1866. Given as the STAR HOTEL VAULTS from 1896 to 1929. Proprietor Mr. S. J. Ramsey issued `a most interesting booklet relating to the ancient historic house.... and the extensive work he had recently carried out......' As reported August 1901. 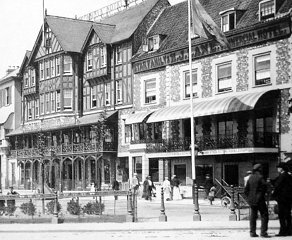 The STAR HOTEL relocated in premises next door, which had been the Cromwell Temperance Hotel. 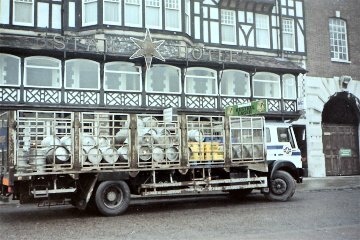 The licence was transferred from the Old Star to the New Star in September 1930. Original house demolished in 1934 to allow building of an extension to the Post Office.